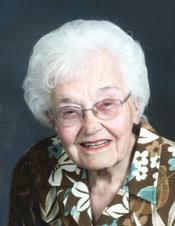 Agnes Barbara Bracker, 99, of Osceola, Ind., died at 3:30 a.m. Wednesday October 23, 2013 at Elkhart General Hospital. She was born March 22, 1914 in Berne, Indiana to the late Frank and Naomi (Sprunger) Amstutz. On March 10, 1935 in Berne, Ind., she married Gordon Wayne Bracker. He preceded her in death on Feb. 18, 1987 in Ft. Wayne, Ind. Surviving are three children, William “Bill” Bracker of Osceola, Amy Lou (Michael) Bracker-Volovski of Altoona, Pa., and Rachel B. (Dan) Jackson of Myerstown, Pa.; ten grandchildren; 29 great-grandchildren; one great great grandchild; and a sister, Anna Marie Neuenschwander of Brene, Ind. She was preceded in death by a daughter, Sarah J. Bracker, a son, Benjamin Albert Bracker and four siblings. Agnes graduated in 1932 from Berne High School. She loved the Lord Jesus Christ, her Savior and was an ardent prayer warrior, she also loved God’s Word and had read through it for fifty years. She served as a pastor’s wife for more than 40 years, was a member of the Osceola, Ind., Grace Brethren Church and she founded the senior citizens group in her church called the “Golden Gracers”. She enjoyed reading her Bible and spending time with her family, watching baseball and basketball. Agnes was an avid Chicago Cubs fan. Visitation for family and friends will be from 5:30 p.m. till 8:00 p.m. Friday, October 25, and from 1:00 p.m. till 3:00 p.m. Saturday, October 26, at the Osceola Grace Brethren Church, 58343 Apple Road, Osceola, Ind. Funeral services for Agnes will be held at 3:00 p.m. Saturday October 26, 2013 at the church. Pastor Greg Serafino and Pastor Dave Knight will preside. A graveside service will be held at 11:30 a.m. Monday October 28, 2013 at MRE Cemetery in Berne, Ind. Memorial contributions may be given to the church or to Bill Glass CFL. Zimmerman-Inman Funeral Home in Osceola is entrusted with arrangements. To send an online condolence, please visit www. Zimmermaninman.com. http://www.youtube.com/watch?v=eaHXhIR60x8 ~ dedicated to a truely great women who loved the Lord with all her heart and was always a great encouragement to this young Pastor.